Syfy's new original series "The Magicians" is hosting an exclusive screening event of its first episode at the University of Southern California's Bovard Auditorium. Social media personality Brittani Taylor (@BrittaniTaylor) will host the event on Jan. 11, which will also feature a live performance by Bebe Rexha. This free event, coincidentally scheduled on the first day of USC's spring semester, begins at 7:00 p.m. and will run until approximately 10:30 p.m.
Based on Lev Grossman's best-selling books, the series follows Quentin Coldwater -- an incoming graduate student to Brakebills College for Magical Pedagogy. This secret New York institution specializes in powerful magic. Soon into their school year, Quentin and his peers realize there are plenty of benefits to its power… and just as many dangers. Bebe Rexha is a singer-songwriter who is quickly rising in popularity. She is featured on the popular singles "Hey Mama" by David Guetta and "Take Me Home" by Cash Cash. She is the lead vocalist of Pete Wentz's band Black Cards. She co-wrote Eminem's Billboard hit "The Monster," featuring Rihanna. Most recently, she worked with G-Eazy on his radio hit "Me, Myself and I." Following its kickoff in Los Angeles, the series' premiere tour will travel the country to host screenings in Austin, Miami, Tucson and New Orleans. Watch the trailer for "The Magicians" below. RSVP to the free event at Bovard here. 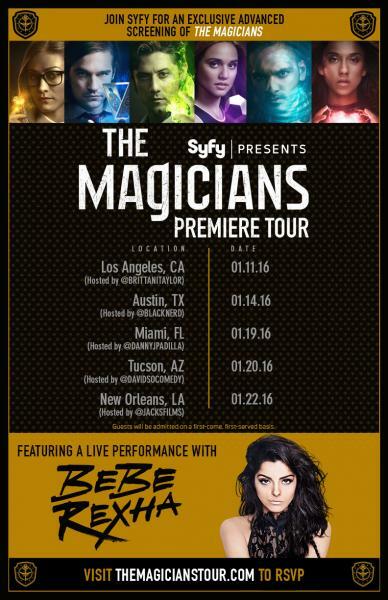 "The Magicians" premieres Jan. 25 at 9/8c on Syfy. Reach Senior Entertainment Editor Kathy Zerbib here. Follow her on Twitter here.